Blackbeard’s fleet in the Bahamas is a well-established crowd-pleaser for divers on a budget. Very few operations offer such a competitive price for a week of diving; Blackbeard’s is a natural choice for young travelers, solo travelers, relaxed adventurers, and even families. The location? World-class dive sites of the central Bahamas, especially the underwater paradise of Exuma Cays and the island Eleuthera. Blackbeard’s liveaboards are dedicated to fostering a unique ambiance of camaraderie and authenticity amongst its guests; making new friends is part of the package. For more than 35 years, divers have left Blackbeard’s with a topside social experience as memorable as their underwater adventures. 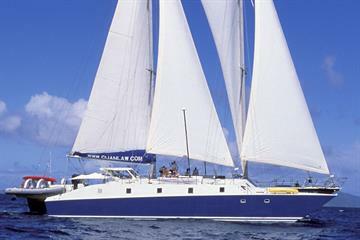 Note: The Blackbeard's fleet is part of All Star Liveaboards, which includes all the vessels below. Blackbeard’s liveaboards, the Blackbeard's Sea Explorer and the Blackbeard's Morning Star, are identical twins and used interchangeably. 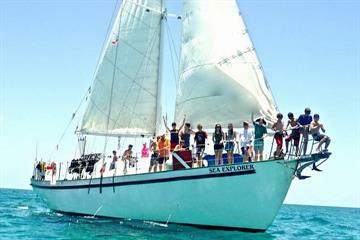 The vessels are sailboats, which provides an extra ounce of fun when the winds are good, from October through April. (Passengers are always invited to help sail.) Dorm-style accommodation fits up to 22 people onboard, with single and double berths available, each with their own privacy curtain. Blackbeard’s fleet describes itself as luxury camping on the sea. Meals and snacks are hearty “American” fare, plus fresh-caught fish and lobster, and are complemented by fresh fruit (available around the clock) and unlimited drinks (including rum punch). When you’re not diving, you may be chatting over a communal buffet meal, relaxing on the top deck, snorkeling leisurely while the ship is moored, fishing or lobstering for dinner, or exploring one of the deserted sandy beaches of Exuma’s 360 islands. Blackbeard's Sea Explorer is a 65 foot sloop with three dormitories and and three heads (bathrooms). There’s air conditioning in all the cabins. Blackbeard's Morning Star, has all the same specifications. Both vessels stock high-quality rental gear, so contact the staff before your trip if you need any items. Blackbeard’s fleet sails the Bahamas as it used to be. 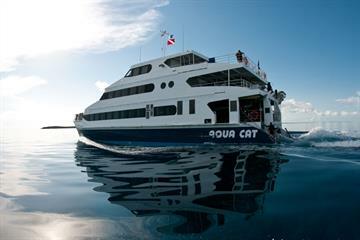 Its vessels traverse the central islands of the country, focusing on the Exuma Cays. The Exumas belong to the so-called Out Islands of the Bahamas, a group of islands with an old-fashioned, low-key Caribbean lifestyle. They are a paradise for nature lovers, fishers, and boat-builders. Exuma Cays is itself an archipelago of coral islands (that’s what “cay” means) stretching for 130 miles. 164 square miles of it are protected in the Exumas Land and Sea Park, making the fishlife and coral spectacular. Long, narrow Eleuthera Island is another Blackbeard’s destination in the Out Islands area. There are great shark diving opportunities here, as well as an important conservation project (the Cape Eleuthera Foundation) which contributes to Caribbean marine research, sustainable development, and education every year. 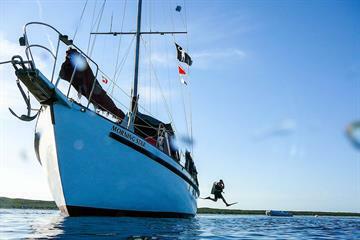 Blackbeard’s liveaboards follow the best diving conditions, not a set itinerary. The captain will make the best choice of Exumas or Eleuthera dive sites each day for weather and visibility, which can reach up to 120 feet if you choose the right spot! This is just one of the ways in which Blackbeard’s personalizes your cruise. The fleet also follows a policy of no led dives, ensuring that you and your buddy can follow your interests and your own pace. In addition, the fleet’s website helps you go deeper into your adventure: they provide fascinating facts about all the local shark species and dive sites, including interesting anecdotes from previous Blackbeard’s voyages. They also provide important conservation information to help you become a no-impact diver and inform you about issues facing some of the ocean’s important creatures. After each detailed on-board dive briefing, you’ll be invited to take the plunge at a unique dive site. Blackbeard’s trips ensure a high diversity of sites, from blue holes to wrecks to drifts. Some of the most famous ones include the Washing Machine, where you’ll be tossed head over heels around a current-washed corner, and Lost Blue Hole, which hosts up to 100 blacknose sharks from late spring to early summer. Amberjack Reef is always a treat, with resident large grouper, sharks, and over 100 horse-eye jack. The Cathedral is another favorite of divers, known for the glimmering light which filters into a large swim-through, bouncing off the scales of thousands of little silversides. Jeep Reef, so named for the sunken jeep which coral has colonized near the mooring, is one of the prettiest reefs in the Bahamas, thanks to a strong current that keeps the water clear and the corals clean. Marine life you can expect on your Blackbeard’s voyage includes eagle rays, huge goliath grouper, nurse sharks, and reef shark species, especially during the shark feeding dive at Austin Smith Wreck. (There’s always a staff member in the water during shark and drift dives.) If you go to Eleuthera, you’ll experience some of the Caribbean’s finest wall diving, with dramatically steep cliffs dropping into the depths. Hole in the Wall is one particular favorite; this dive site combines a swim-through and a literal hold in the wall through which you can drop. Split Coral head is Blackbeard’s Eleuthera shark dive site, and also offers swim-throughs and a great nearby wall. You’ll probably dive a total of 19 times over the week, witnessing underwater life unfold from dawn until dusk; night dives are also offered regularly. By the time you reach Nassau for your last meal with your new friends, you’ll have unforgettable memories. 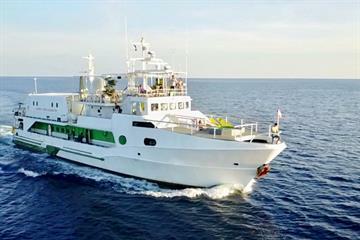 Blackbeard’s liveaboard fleet is the window to a Bahamas diving adventure all about the people, the places, and the magic of the Caribbean ocean.